Your Cook shed is the perfect opportunity for a clean slate and to make it anything you want or need! Of course, it’s a great place to store all your extra stuff but it can also be an extension of your home. Think about it, oftentimes the place that you need for your favorite hobby or activity is the one that gets squeezed out if you don’t have the interior space. Well then why not move your hobby out to your converted Cook building? Not convinced? Or wondering about the expense and effort? Trust us it won’t take much to make your portable warehouse into the perfect place for any hobby. Here are 5 reasons why you should turn your Cook shed into your hobby space. It can be a retreat, separate from your house and any issues and responsibilities. So whenever your kids are messing up that newly cleaned kitchen or the hot water heater is on the fritz, you have a place to disengage from the stress and just relax. It's a great way to extend your outdoor living space from your home or patio. If your backyard is small, just open up the doors to your newly decorated Cook shed and extend the space. Then, you can have separate seating areas around your yard to keep guests comfortable. It’s an extra room that you don’t have to worry about if it gets messy. Unlike the living spaces in your home, you can leave your kids toys or your crafting supplies on the floor without worrying about a surprise guest showing up. It's cost-effective. Turning your existing shed into a hobby space will help you avoid costly construction work to your home. If you only have to design and fill one room the cost will be reasonable and the payout will be huge. It adds value to your home. An extra room that is fully functional will add immediate value to your property. So even if you aren’t thinking about selling or moving anytime soon, it’s a solid investment. 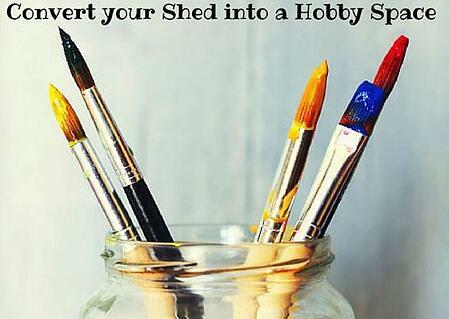 Here are 4 ideas to convert your shed into a hobby shop. But of course, it should conform to your needs and whatever you are interested in! Arts and Crafts Studio. If you’re looking for a place to get inspired, brings your paints, pencils, canvases, quilting supplies and other artistic stuff outside to your Cook shed. Our buildings have the option of windows, to help you get further inspired by nature. Music Studio. If you like to rock out with your favorite instrument or have a band that needs to practice, your shed is the answer. For more on converting your shed into a music studio, read this post! Gaming Studio. Say you have a favorite video game (or a few favorites) but you can’t ever get any time in front of the TV? Make your shed into your gaming studio, so you can play whenever (and however loud) you want! Greenhouse/Potting Shed. This option allows those of us with a green thumb to garden year round despite the weather. Then, your family can have fresh herbs and beautiful flower arrangements all year! Find creative storage ideas for your Garden Shed here! 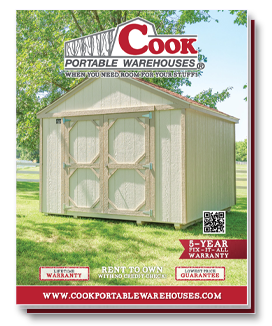 For more ways to convert your Cook building into the space of your dreams, download our free Shed Conversion Guide by clicking the button below!